In Morocco you’re going to see a lot of red and green. These colors adorn their flag, decorate apparel, and are prominently featured on schools across the countryside. These festive colors also remind me of Christmas which always puts me in a good mood. On the morning of Sept 14th, as we begin our journey into the Atlas Mountains I glance to my left and noticed an enormous Moroccan flag dancing in the wind near the village of Imlil. 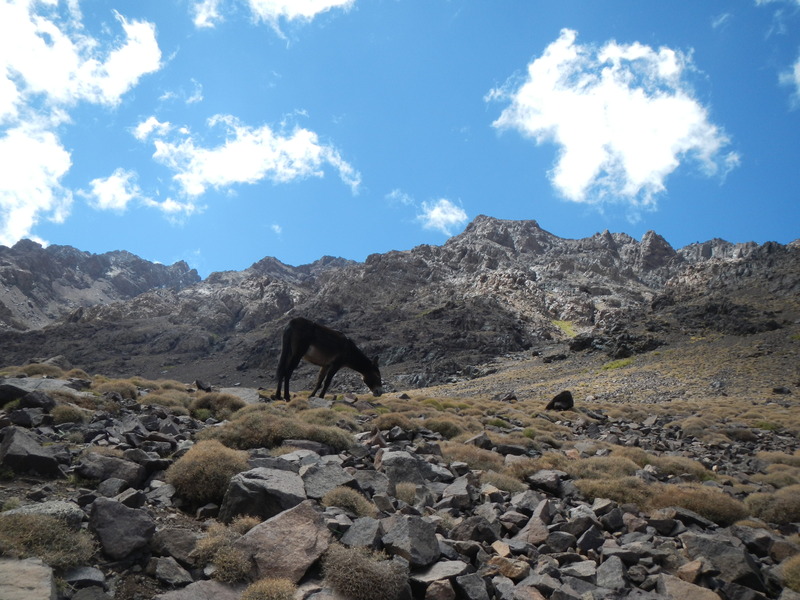 I’m not sure what Toubkal will have in store for us but mountains are unpredictable mistresses. 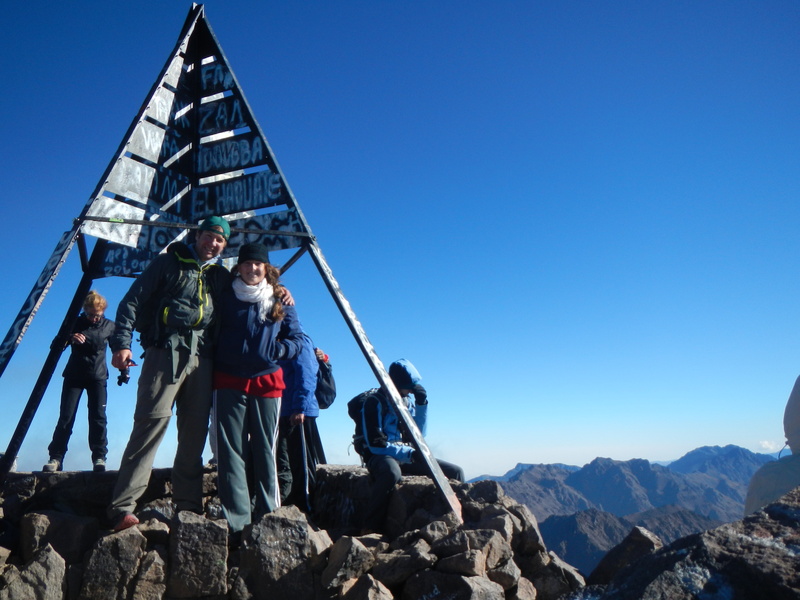 Toubkal is typically attempted in two days and sometime three. Extremely ambitious and experienced climbers can try to summit on the first day if the weather cooperates but they’ll have to stay in the high mountain refuge after they come down. 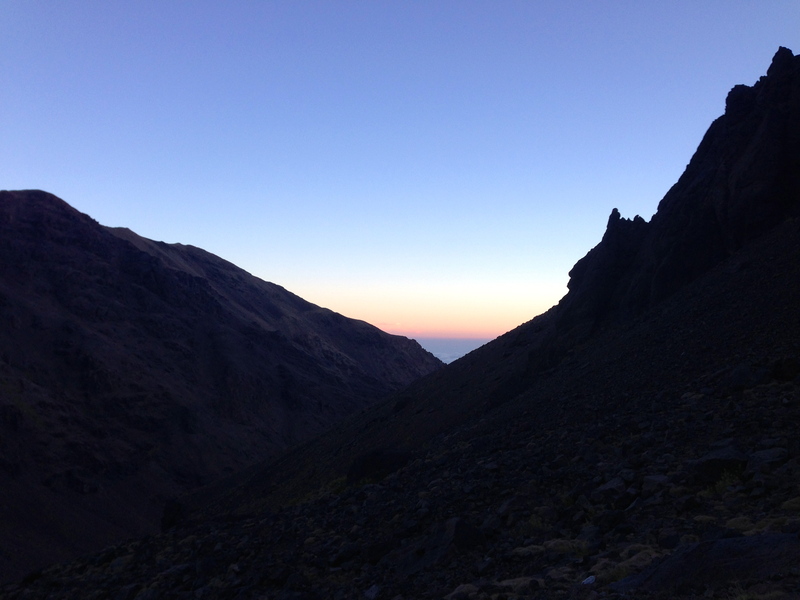 We opt to climb to the refuge then summit at first light the following day. If you leave Marrakech head toward the town of Imlil in a Grand Taxi but be prepared to change to a smaller car one along the way. Travelers should be expected to pay roughly 30-40 dirhams. From Imlil, walk up the road until you pass the Pizza place; make a right and continue. It will veer left at which point you’ll have the option to follow a curvy road headed up the hill on your right or the walking path strait ahead. Either way; it’s customary to confirm with the next half dozen people you see to make sure your headed in the right direction. Be wary though, because you may be inadvertently negotiating with a porter who will want money for his advice. The walking path will take you through some thinning trees and you’ll quickly begin a gradual ascent. The famous Kasbah du Toubkal will be on your left. For me, around this time it became obvious I was wearing too much clothing and decided to zip off my convertible pants and strip down to my t-shirt. My sister watched on with envious eyes having decided to honor conservative Moroccan female hiking apparel. About half a kilometer further you’ll move into an exposed area climbing quickly up the right side of the hill. Soon you’ll connect with the slower but gradual windy road and pass through the small town of Aroumd which is surrounded by rich orchards. My sister and I were hoping to find a generous farmer to buy some ripe apples from we didn’t have any luck. 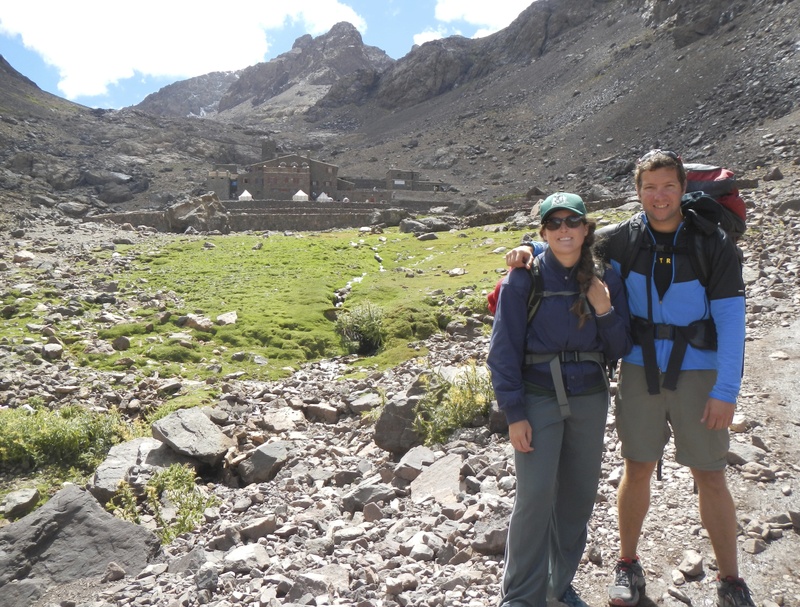 The path to Toubkal will then cross a giant floodplain. The terrain is wide open and filled with fist-sized gray stones. The trail will meander across the dry river bed; if you lose the track, just look for fresh donkey droppings and you’ll be headed in the right direction. 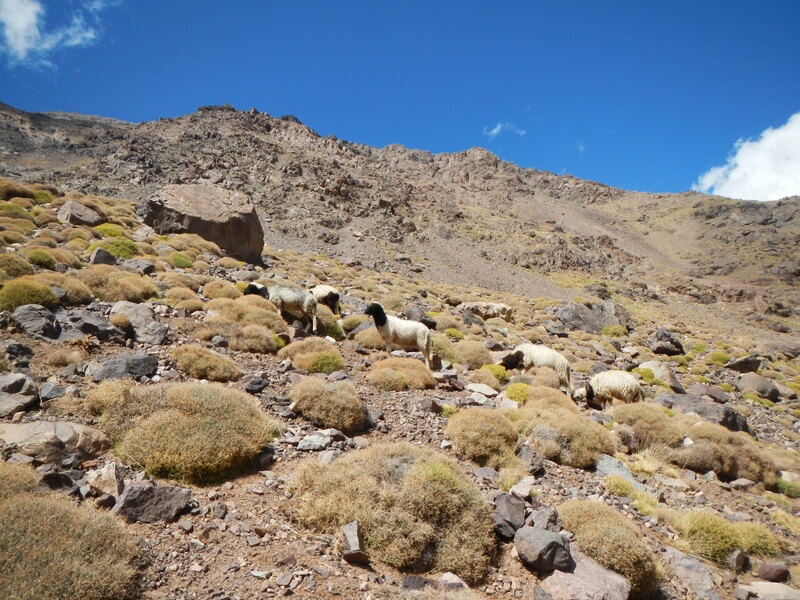 As the plain thins you should veer toward the left side of the valley where a rusty sign will welcome you to the Toubkal national park. Now the hiking really begins. You’ll make steady progress up the left side of the valley gaining height over the iridescent stream which will now be visible. The trail is in decent shape filled with loose rocks, gravel, and dust as dry as ground bones. You should expect to be sharing the piste with heavily loaded donkeys and the occasional pedestrian ferrying goods up the slopes. Your first notable milestone will be the tiny settlement of Sidi Chamharouch. You’ll cross over a concrete bridge and zig zag up the valley gaining altitude at a steady but aggressive rate. Soon the switchbacks will cease and you’ll climb on a diagonal up the valley. The size and scope of the Atlas Mountains will now begin to take shape as you notice the steep faces on either side. You’ll pass several shacks selling geodes and bottles of dusty Coca Cola. 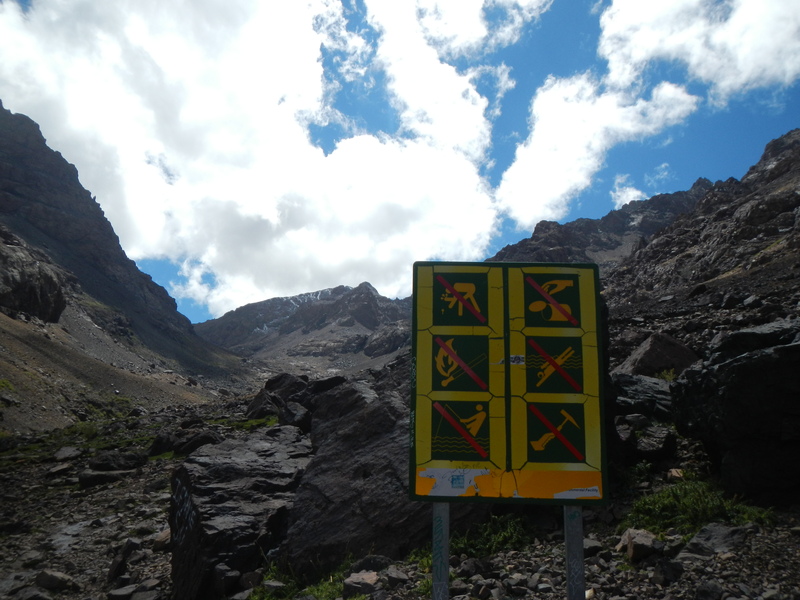 You will likely be tempted but it’s probably best to keep hiking. At this point winds began to rush down from the hills and the temperature plunged. We decided to layer up again. The valley will bend and snow capped peaks will provide the next contrast to the arid landscape. Occasionally, the sound of your feet kicking up gravel mixed with manure will be interrupted by the sound of a whining goat. Herds of small animals roam the high valleys managed by a lonesome shepherd whistling them along. After 4 hours of hiking and 4800+ of vertical gain you should get your first glimpse or the refuge. Its dark gray stones boldly oppose the surroundings as it sits nestled near the top of the valley. It’s a sight for dusty-eyes and a motivating one at that. The final approach is optimistic. The refuge is surrounded by a light green pasture, grazing donkeys, and a few brave campers nestled around stone outcroppings. Travelers have two options. The first lodge is a bit pricier but quite nice. 240 dhrs per head for a bed, shower, and dinner. The second refuge is for the discount hikers. 92 dhrs. About $12 USD. However, they charge per meal; 50 dhrs for dinner, 40 dhrs for breakfast. At this point your brain starts to play tricks on you. Mine opted for the cheaper bed but insisted on food, including a round of chilled Coca Colas and imported Snickers bars. I haven’t bothered to do the math yet but it probably came out about even. The kindly refuge manager showed us to our cots in a shared space with roughly twenty other hikers. With nothing to do but rest our weary feet we quietly unpack and head down to the common room waiting around for dinner. Travelers are either telling you a fantastic story or the most truthful things they have ever said to anyone. The amazing thing about meeting people doing unusual things is to learn why they are there. You will listen intensely too, hoping to uncover some shred of rationality for your own decision making. It’s strange because you’ll be simultaneously skeptical yet tremendously curious. How can this person possibly have the time to summit a mountain in Morocco in the middle of September? You start to think. “Their life must be so great, since they have all this free time.” These emotions are ridiculous of course. It’s just repressed insecurities betraying rational thought. My sister and I befriend a group of young adults; a Russian and Ukrainian who happen to live in Seattle. They hiked up with a maritime engineer from the Netherlands. We also meet two Norwegian girls. One of them intimidated the men with her intellect and the other with her beauty. An Italian man also joins us for dinner who successfully climbed in one day. I’m a little put off by his success initially but I accept it by believing we were probably carrying heavier packs; despite my efforts to be more mindful I find myself being occasionally resentful. It’s something I need to work on. The conversation at dinner criss-crosses a variety of topics including: geopolitics, religion, employment and personal histories. Willkomen from Holland breaks the ice by telling a funny story about getting a large passenger kicked off a plane due to their girth. Interestingly, everyone is more open about their lives and personal hygiene in ways that only travelers in close quarters can develop a sense of comfort with. After a traditional harrira soup and chicken tagine we move back into the common space to relax a bit. The Norwegians sit across from the Russians and I sit between them. A Cold War era sexual proxy war begins but there are no hostilities; everyone is tried and we just decide to go to sleep. Some climbers are leaving as early as 0300 to begin the final ascent. A harrowing 3800 feet over 3 miles. My sister and I decide to leave shortly after 6. About an hour before sunrise. In the morning we wake to find nearly the entire refuge empty. Almost everyone has already left which makes us a little depressed. As we exit the cold refuge into the dark morning we exhale clouds of steam and the first few hundred yards remind us we’re already at altitude. Unfortunately, my headlamp isn’t working so we rely on a weak flash light and iPhone to illuminate the path. Regrettably, we don’t follow our initial instincts and hike far above the refuge trying to catch up with a group we see above us. This broke a cardinal rule of following — assuming the other guy is heading where you are. When we finally catch up he points high up the left side of the dreary valley toward a small team of climbers slowing making a steep climb up a narrow edge. We missed the trail head and with our spirits only slightly bruised decide to cross the ravine, forge a stream, with the hope of coming down on top of the path. We scale the side of the mountain tripping over rocks and dodging thick bunches of sharp thistles. Day break above the refuge. Finally, as the first glimpses of daybreak extend across the sky we regain the right trail. We follow it over a steep climb into a rock field and promptly lose it again. Not dissuaded my sister and I scale the boulders and lose rocks causing small slides. This raises our sense of danger and we wisely decide to evacuate to the left. Amazingly, we spy a few hikers who seem to have followed the path without issue. We zero in on their position and regain a sense of control over the frigid morning. As we cross above the first large boulder field a shearing wind begins to blast us keeping our tired muscles constantly contracted to maintain balance. At this point we loose feeling in most of our appendages even as the morning light starts to irradiate off the peaks. By 0800 we enter the second rock slide which we rename the valley of despair. At this time I being to seriously question our decision to summit with such light gear and so little knowledge of the climb. I look back as a gust of wind almost topples my sister over. I kindly ask her how she’s holding up and she politely responds with, “Ma brrrfrrace est frozen bitten?” I replied, “I think we can make the next ridge then we’ll re-evaluate again.” My sister and I are as stubborn as high altitude goats; twice as stubborn and competitive when together. Climbing mountains is a real head game. Especially if you are basically lost, on a continent where you can’t speak any of the languages, it’s below freezing, there’s a 45 kilometer cross wind, and you start your day off by eating toothpaste. To manage this stress for some reason my mind starts to wander and Christmas carols begin to echo in the chambers of my head. It’s a strange thing to be practically losing your mind to the tune of “Oh come all ye faithful” and “Little town of Bethlehem” but for some reason it worked. It also helped me keep my mind off the fact that my sister’s face was practically frozen shut and that this climb might not have been a good idea. We are prideful though and my sister kept lock-in-step with me; even as I desperately wished she’d beg us to turn around. I was miserable. Enfin, the first rays of sun kiss the high ridge and the only thing between us and the illusion of warmth is a steep grade and two ice fields. After a seriously slow crossing we finally step onto the sun filled ridge and we are instantly filled with fresh optimism. We are also blessed with a remarkable view across the Atlas Mountains. The only thing preventing perfect visibility are my frozen tears and imperfect eyes. We continue left across the ridge in a parallel route. One false peak after another starts to sap our energy once more. Finally, several hundred yards away on a lazy berm awaits an awkward pyramid of metal with other successful hikers clumsily dangling off of it. Crystallized ice clouds drift by occasionally obscuring an expansive and awe inspiring 360 degree view of North Africa. The cold weather had one positive side-effect; 150 miles of visibility. It’s hard to explain the enchantment, exhaustion, and guilt one feels at moments like these. You doubted you could make it. You questioned your judgment. You escaped the torturous reality you voluntarily put yourself in and yet you experience a sublime relief. Peace isn’t something I come across very often. But at the crack of dawn at the top of the highest peak in the Atlas Mountains my state of mind matched the purity of the panorama. My sister and I at the top of the highest point in North Africa. After a controlled decent over several hours a.k.a. trying not to fall off the face of the mountain we finally made it back to the refuge. We wolfed down a coke, half a Snickers bar, and three Pringles each. We said adieu to our friends from their respective countries with hand shakes and bisses. We’re eager to get down from the refuge and back to the comforts of Marrakech to liaison with our father who is joining us after a safari in the Mara Triangle. After a four hour decent we finally made it back to Imlil. Off to the right the same proud flag waving in the wind– joyful and triumphant.